We had a lovely half term break with a couple of trips into the West End, a special meeting with Tree Fu Tom and finished off with a trip to visit nanny in the countryside. Unfortunately towards the end of the week everyone started to succumb to coughs and colds and in my case, laryngitis! I don’t think I’ve felt so ill in a long time and I found out just how difficult it is to look after two small children when you’ve lost your voice. Thanks to our role as Playmobil Playologists I received a box of the latest Playmobil toys which kept Big Brother and Little Sis happy whilst I was recuperating. 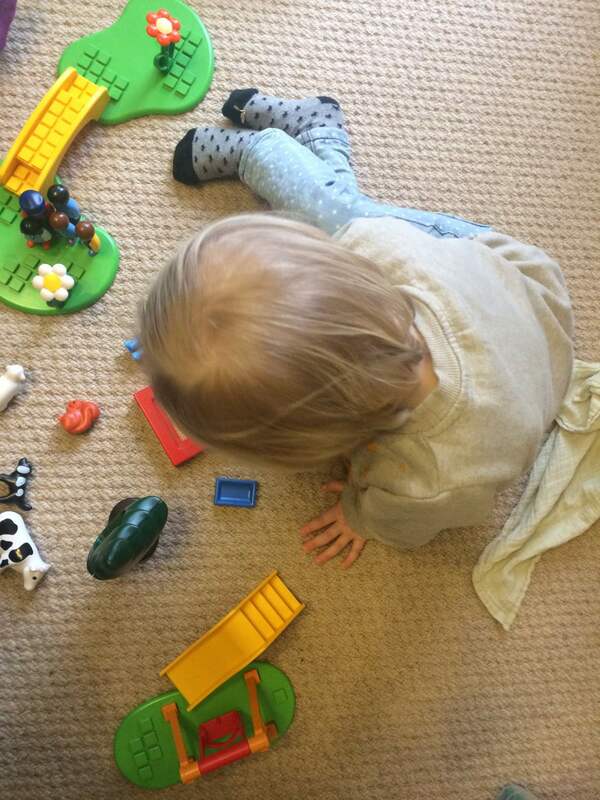 Little Sis was sent Playmobil 1-2-3 sets 6788 and 6785 which are perfect for little hands aged 18 months and over. They compliment the other Playmobil 1-2-3 set she received and she’s been having lots of fun. 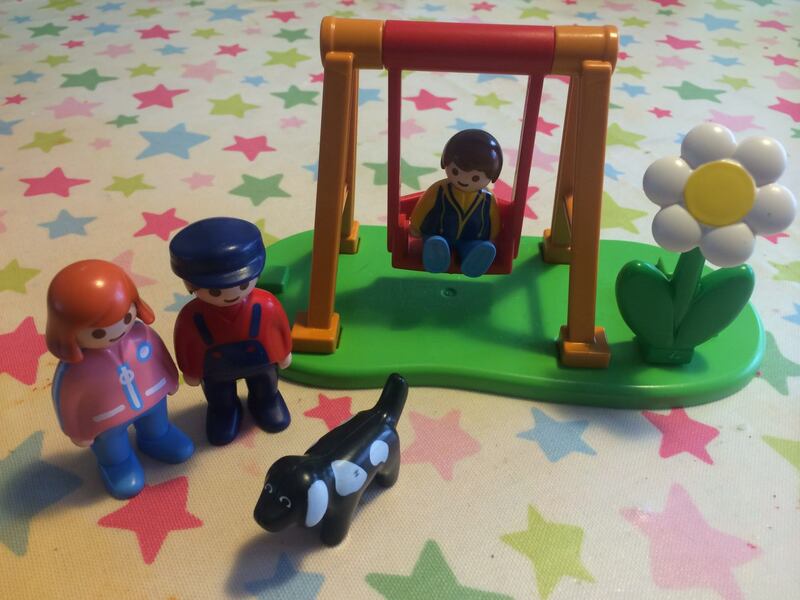 The Playmobil 1-2-3 range has been designed for little people and feature bright colours, round edges and chunky pieces. Little Sis really adores the little playsets and has been completely wrapped up in her small world play. I’m certainly happy that she won’t come to any harm as the pieces are quite substantial and there are no worries about any small pieces. Set 6788 (Meadow Path) included a bridge, pieces of grass, three figures and four animals, a tree and flower. Set 6785 (Park Playground) includes three figures, a sandpit, slide, swing and flower. I think I would recommend that you need more than one playset to get the most out of it. Little Sis has been mixing and matching with our normal Playmobil and creating all sorts of little worlds. My only quibble is that the people’s legs don’t slot onto the squares on the bridge or the grass pieces, unlike the flowers, so I wonder what the point of them is. Meadow Path costs £14.99 and Park Playground costs £9.99 which is good value for such robust toys. It’s definitely a classic in our house. Sorry you have been ill, hope you are feeling better now. Playmobil seemed to pass us by with our eldest but I think my youngest daughter would really enjoy playing with something like this. I had no idea they did special sets for under 3s, will go and have a look at them for my 2 year old. I loved Playmobil when I was little! We’ve always bought happy land rather than playmobil, but these look so great I might have to start getting these as well! Hope you’re all feeling better! We love Happyland too. The 123 range is great though, and the figures bend in the middle! They have a great timeless quality don’t they. looks adorable, especially the cow!